Replacement O-rings for Taco pump flange. May be used to wire pumps when installed on furnaces. Power Supply Cord (p/n 556) includes strain relief; Power Supply Cord (p/n 555) does not. Power Supply Cord, 32" Each kit includes set of two female iron pipe (FIP) pump flanges. One set is used with each pump. Most installations use Pump Flange Kit, 3/4" (p/n 119). Each kit includes set of two female iron pipe (FIP) pump flanges. One set is used with each pump. May be used to wire pumps when installed on furnaces. Power Supply Cord (p/n 556) includes strain relief; Power Supply Cord (p/n 555) does not. Power Supply Cord, 48" Brackets for supporting and securing Taco pump and flanges to a wall. Figure shows one possible installation scenario. Pump, flanges and mounting hardware are not included. Isolation Flange with Drain Valve, 3/4"
Each kit includes set of two female iron pipe (FIP) pump flanges. One set is used with each pump. Kit includes flanges, nuts and bolts. *Note: Price is for one flange only. Kit includes flanges, nuts and bolts. Full port, valved flange body. Replacement cartridge, bronze, for Taco Pump 007 series pumps. Includes a 3-year warranty. Kit includes flanges, nuts and bolts. Full port, valved flange body. Replacement cartridge for Taco Pump 006 series. Includes a 3-year warranty. Replacement cartridge for Taco Pump 009 series pumps. Includes a 3-year warranty. Taco 007 Circulation Pump requires flange kit (not included). Includes O-rings. Power Supply Cord (p/n 556) sold separately. Replacement cartridge available (p/n 5800005). Replacement cartridge for Taco Pump 014 series pumps. Includes a 3-year warranty. The 007e is a high efficiency, wet rotor circulator with an ECM, permanent magnet motor. Its ECM performance is equivalent to the 007 and uses up to 85% less electricity. The 007e has features to make it more reliable and to help purge air. Replacement cartridge, bronze, for Taco Pump 011 series pumps. Includes a 3-year warranty. Taco 006 Bronze Circulation Pump for domestic water systems. No flange required, 3/4" sweat connection. Power Supply Cord (p/n 556) sold separately. Taco 007 Circulation Pump requires flange kit (not included). Includes O-rings. Power Supply Cord (p/n 556) sold separately. Includes low voltage terminal strip for connecting a low voltage thermostat directly to the circulation pump. Includes Priority switch allowing one zone to have priority over others. Taco 009 Circulation Pump requires flange kit (not included). Includes O-rings. Power Supply Cord (p/n 556) sold separately. The Taco Viridian VR1816 pump is an infinitely-variable speed, high-efficiency wet rotor circulator with an ECM permanent magnet motor. Operating modes include infinitely variable fixed speed and self-adjusting constant pressure or proportional pressure variable speed. 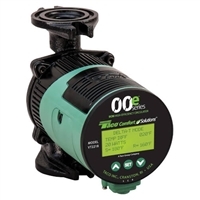 The Taco Viridian VT2218 pump is a temperature sensing, variable speed wet rotor circulator with an ECM permanent magnet motor. Operating modes include Delta-T differential temperature, 4 fixed speeds, set point heat, set point cool and boiler protection. Taco 014 Circulation Pump requires flange kit (not included). Includes O-rings. Power Supply Cord (p/n 556) sold separately.